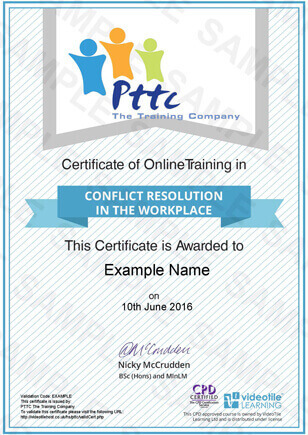 Our on-line Conflict Resolution Training Course from PTTC E Learning is essential for anyone who might come into contact with conflict in the role in the workplace. Conflict in a lot of cases is unnecessary & avoidable, so learn how to manage conflict more effectively today. Its pointless buying a course & spending time learning, when it wont fit your purpose. So our Conflict Resolution e learning course is 100% fit for purpose and accredited by a major educational player in the industry sector, so you can rest assured you wont be wasting time or money with us! Who Is This Conflict Resolution Training Course For? Our PTTC E Learning Conflict Resolution (Management) Course is perfect to provide or enhance existing skills in conflict resolution especially within the workplace. As ‘Unmanaged conflict is the largest reducible cost in most organisations today, and one of the least recognised’. 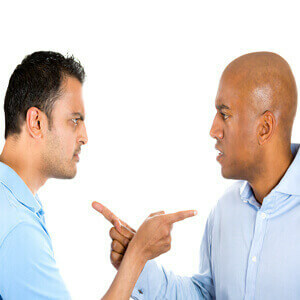 Conflict can occur within any workplace, and between anyone. Conflict much to most peoples surprise is normal, and can be a health part of life and relationships as people are individuals and they cant be expected to agree on everything all of the time. Learning to effectively deal and manage conflict is a skill we normally learn as we go through life, and relationships with others. What we also must consider is that All employers have legal responsibility under the Health and Safety at Work Act 1974 and Management of Health and Safety at Work Regulations 1999 to ensure the health safety and welfare at work of their employees. This includes minimising the risk of stress-related illness or injury to employees, and conflict within the workplace can lead to increased levels of stress and an increased risk of violence and aggression. Conflict normally comes about whenever people disagree over such things as their values, motivations, perceptions, ideas, or even desires. Within the workplace especially in customer facing roles conflict can also occur when products or services may not meet another expectations or standards, or perhaps a product is faulty. Sometimes these differences look trivial to us, but when a conflict triggers strong feelings or emotions, a deep personal and relational need is at the core of the problem and a need to feel they or their opinion is respected, valued, safe and secure is required. If this inst found or achieved then conflict can occur and even escalate in to verbal abuse or even violence if not managed correctly. Why Do You Need Conflict Resolution Training? As we mentioned earlier every employers has legal responsibility under the Health and Safety at Work Act 1974 and Management of Health and Safety at Work Regulations 1999 to ensure the health safety and welfare at work of their employees. So reducing the risk of stress-related illness, and injury is a legal requirement. This course will consider what conflict is as well as its impact and role in the workplace. We will consider some of the triggers for workplace conflict and how it develops before looking at a number of different ways of managing it more effectively. Our PTTC E Learning Conflict Resolution (Management) Course is perfect to increase knowledge, understanding and skills to help you or your employees provide or enhance existing skills in conflict resolution especially within the workplace. Our Fully Accredited and Industry Approved On-line Conflict Resolution Training Course is aimed at anyone that may come into contact with Conflict within the workplace or their day to day duties at work. This introductory module will take you through the course and its structure, and then in to the causes and symptoms of conflict. Within this module you will learn about the Dual Concern Model and how to use it to better help resolve conflict. This key module will explain the 5 modes of conflict & methods of dealing with or resolving conflict at work. This module will explain how to understanding the attributes of conflict, and use the modes to help reduce conflict. This module will explain why being Assertive in conflict situations can sometimes be beneficial, how ever using it at the right time & in the right way is vital. In conflict situations positive outcomes are always what we aim for, this module will teach you how to better obtain a positive outcome out of confilct. This course has the vital content to provide employees with far greater skills and knowledge to deal with Conflict & Conflict Resolution in a helpful and informative online course format. This course will help those that face conflict to reduce and manage it better, while also helping organisations to reduce workplace stresses and to comply better with, and Health & Safety at Work Act 1974, the Management of Health & Safety at Work Regulation 1999, by providing training and education in good working practices, skills and knowledge to reduce & prevent conflict situations man occur. it also provides yourself and your team with a cost effective training solution as well as being one of the best groundings in this subject area for a fraction of the price of other courses. By learning online with us at PTTC The E Learning Training Company, the main outcome of this training course is to provide you or your team members with a recognised qualification, and the knowledge and awareness of identifying and understanding Conflict, and knowing the necessary precautions to take to reduce conflict that can help reduce risks of assaults and reduce work place stress. Once you or your team members have successfully completed course that takes around 1 – 1.5 hours, you can simply download the certificate. If you are not sure if our On-Line Conflict Resolution Training Course is the right course for you, or if you’re a bit dubious as to the quality of our training course will be what you’re expecting why not try one module of the course of your choice inc the assessment FOR FREE . This will give you a free chance to experience hands on our on-line learning environment. To get a Free Trial Just click on the ‘Free Trial Logo & follow the video instructions to access the online learning area. Once you have trialled the module you will then be given the option to purchase & continue with your course! Our On-Line Conflict Resolution Training Course has 45 minutes of video to watch, and 25 questions to answer. We estimate that the course should take you no more than 1 hour to complete. If you want to do it over a number of days then that’s fine, the system will remember where you left off and you can go back to it at exactly that point. The simple answer to this is yes, our Conflict Resolution Training is, the course is CPD Certified (Continued Professional Development) so you can rest assured that this course will meet your needs if you are looking for a competent introduction to the Conflict Resolution Training. There no problem with that, with our system you get 3 chances as standard to take and successfully pass the Conflict Resolution Training Course. If you are still unsuccessful at that stage, then just drop us a line and we will provide you with 3 further attempts free of charge. This type of training gives lifelong knowledge & skill. There is no legal need currently to take the Conflict Resolution Training Course again, however like any skill or knowledge we learn memories fade over time especially if we don’t use those skills. So, you can always come back again if you wanted to and refresh your skills and knowledge by purchasing and completing the course again. That’s easy as well. You can pay for your Conflict Resolution Training Course online with your credit card, debit card, or PayPal. However sadly we no longer accept cheques, sheep, horses, or gold.